Posted on Thu, Jan 19, 2012 : 9:31 a.m.
Traffic moves through near whiteout conditions this morning on southbound US-23, north of Ann Arbor. 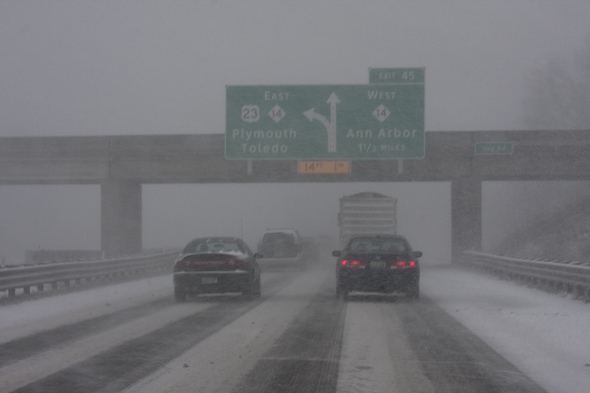 Snow falling this morning has caused slick conditions and led to several crashes on Ann Arbor area roads and freeways. Seven Mile Road in Northfield Township was closed after several crashes. Accidents were reported in multiple locations. “They’re all over the place,” a dispatcher for the Washtenaw County Sheriff’s Department said at 9:25 a.m.
Several crashes on Interstate 94 were slowing travel in both directions. Among those causing slowdowns were at eastbound 94 and Jackson Road on the west side of Ann Arbor. US-23 and Carpenter Road near Milan, westbound 94 and Rawsonville Road east of Ypsilanti and eastbound 94 at Dancer Road west of Ann Arbor. An injury crash had been reported at Geddes Road and Brookside. Seven Mile Road was closed at Rushton Road after four crashes in the area, a dispatcher said. Police had called for a Washtenaw County Road Commission truck to lay down salt in the area. Snow was expected to fall for two to three hours this morning, the National Weather Service said. The forecast calls for falling temperatures throughout the day and more snow Friday. Washtenaw County Road Commission trucks have been out salting and scraping roads since the snowfall began, said Jim Harmon, director of operations. The timing of the snow, during the morning rush hour, slowed progress however. Thu, Jan 19, 2012 : 10:51 p.m.
For those interested you can listen to the sheriff's dept here on your PC. <a href="http://www.radioreference.com/apps/audio/?feedId=3913" rel='nofollow'>http://www.radioreference.com/apps/audio/?feedId=3913</a> Hit the listen button to the left. Fri, Jan 20, 2012 : 12:36 a.m.
jcj's link is the scanner for all of Washtenaw County - police, sheriff, HVA and fire. I think it can show us what a difficult and good job they do. They are very professional and willing to do the hard stuff. Thu, Jan 19, 2012 : 9:10 p.m.
Thu, Jan 19, 2012 : 5:29 p.m.
Well it just goes to show you learn something new every day. All this time I thought US 13 went from Pennsylvania to North Carolina and it turns out it goes through Michigan now to. Incredible. Thu, Jan 19, 2012 : 7:47 p.m. The caption on the photo has been corrected. Thanks for pointing out the error. Thu, Jan 19, 2012 : 7:15 p.m. Sorry WCRC doesn't want people to know this info I guess. Thu, Jan 19, 2012 : 5:57 p.m. Beat me to it. Seriously. It hurts. How was that missed?! Thu, Jan 19, 2012 : 5:03 p.m.
<a href="http://www.usroads.com/journals/p/rmj/9712/rm971202.htm" rel='nofollow'>http://www.usroads.com/journals/p/rmj/9712/rm971202.htm</a> "Time The longer a de-icing chemical has to react, the greater the amount of melting (see graph). At temperatures above 20o F both salt and calcium chloride can melt ice in a reasonable time. At lower temperatures salt takes much longer." "Time of Application Timing is the most important factor in successfully clearing snow by chemical treatment. Early application is critical. Spreading a small amount of de- icer when snow is loose and unpacked melts a little snow and turns the rest to slush. Traffic cannot pack down this slushy snow which is 15% to 30% water. This lets plows remove it easily. "Time of Application Timing is the most important factor in successfully clearing snow by chemical treatment. Early application is critical. Spreading a small amount of de- icer when snow is loose and unpacked melts a little snow and turns the rest to slush. Traffic cannot pack down this slushy snow which is 15% to 30% water. This lets plows remove it easily. Thu, Jan 19, 2012 : 4:43 p.m. I can't speak on the condition of the freeways, but the surface roads were a little nasty. They were covered in just snow, not ice. It's true that the roads are not being cleared effectively. However, I must say that the majority of people I saw on the road today were driving as if there was absolutely no snow on the ground, going well above the speed limit, tailgating, slamming on their breaks, and overall just acting in a foolish manner. I drove a little under the speed limit and allowed for significant space between the car in front of me and myself and I had no sliding issues whatsoever. If people would give themselves enough time to get to their destination, slow down and act responsibly, the number of crashes would be reduced significantly, whether or not the road conditions improve. Thu, Jan 19, 2012 : 4:29 p.m.
Its sad others who have little value for their lives and the lives of others put so many in danger. Isn't witnessing other accidents on the highway enough to evoke caution? I avoid the highway at all costs...period. Thu, Jan 19, 2012 : 4:13 p.m.
Cindy Do everyone a service and ask the AAPD and the Washtenaw County Sheriff's office. What is the biggest reason for most of these accidents! Thu, Jan 19, 2012 : 3:41 p.m.
justcurious, do you have a personal vendetta against the road commission? It never ceases to amaze me that we should only blame them when it snows for the number of accidents on the roads. Whenever I am out during snow no matter how little I always slow down and watch out for those who don't. While I would love to have clear roads all the time I know it's just not going to happen. I agree with the other posters and say to anyone who is afraid to drive in snow just stay home. Thu, Jan 19, 2012 : 10:48 p.m.
Nope Washtenaw County. I listened to sheriff reports also this morning. I never said accidents were not happening. I just told you what I saw. I did not make it to 52. Thu, Jan 19, 2012 : 7:12 p.m.
jcj, you must have been in Jackson County because there were numerous accidents west of Ann Arbor (M-52, etc.) Get a scanner, get informed. MgoBlueMomma, what is your source of authority on the WCRC? A truck just drove down my road at 2:20pm plowing a BARE road at 55 mph! What's with that? justcurious II was out for a couple hr excursion west of A2 late morning. I saw 1 pickup in the ditch and no evidence of any others that had driven off the road. I never put my truck in 4 wheel drive. And as a person of your experience should know. A pickup with rear wheel drive and no weight is about as bad as it gets on slick roads. I was driving about 50 mph on I-94 not 80 mph. And I made it back. Thu, Jan 19, 2012 : 6:01 p.m.
Nobody has any self responsibility anymore...if they drive like maniacs and crash its the salt trucks fault because the roads weren't salt and dried for them,these are probably the same people that have to have the city install cross walks in the middle of every road in town causing accidents because the can't see to figure out how to safely cross the street without having someone hold their hand. Thu, Jan 19, 2012 : 5:28 p.m.
You have no clue what those drivers go through this time of year. And people like you who are so quick to complain don't make it any better. You think getting rid of the road commission will make things better???? Who else would do their job. The city? Yeah cuz they do such an awesome job now too. You obviously do not understand the dynamics of the road commission by your posts. Sorry for that. Because I think giving the weather elements they do the best that they can do. The crazy drivers don't make it any easier either. Thu, Jan 19, 2012 : 5:07 p.m. I have been driving for 50 years plus and I too drive carefully. I am not afraid to drive in any condition because I drive defensively. I do know that some drive too fast for conditions. That is obvious. But I still believe that the Road Commission makes very bad decisions in regard to clearing our roads of ice and snow. I don't believe they get their trucks out there early enough and I don't believe they use sand enough. The road commission does not have to answer to the people because they are not elected by the people and they know that. I agree with those trying to abolish it. Thu, Jan 19, 2012 : 3:01 p.m. So what this proves is that the numbskulls out on the roads will never learn to slow down! Most of the drivers but not all are reaping the &quot;benefits&quot; of leaving home late, talking on their cell phone, eating breakfast while driving,and speeding! This is why the rest of us have to pay higher premiums. Thu, Jan 19, 2012 : 4:14 p.m.
@jcj, I agree with everything you said in all of your posts here. Thu, Jan 19, 2012 : 3:43 p.m.
JGS, people need to get to work, to the doctor, to school, etc. The Road Commission knew this was coming. The police should not be calling for them to salt and do their job. Now there are horses running in the road due to accidents plowing down fences, vehicles submerged in water on Pontiac trail. Thu, Jan 19, 2012 : 3:26 p.m.
@justcurious - If the roads are too &quot;unsafe&quot; for you, then just stay home and off the roads. You can't rely on the WCRC to clear you a personal path to work. Slow down or stay home until they can get out there. Thu, Jan 19, 2012 : 3:22 p.m. Right, and the drivers should go out there and salt and sand the roads to make them safer!! Thu, Jan 19, 2012 : 3:20 p.m. They sure don't slow down. I've got 4WD and never engaged it, I simply slowed down and watched the other vehicles pass me @70MPH+ !! That is just crazy in these kinds of conditions. We can't lay all the blame on the WCRC, it's called SLOW DOWN! Your job will be there when you get there. If you absolutely have to be to work at a certain time or you'll lose your job, then plan accordingly. Sorry... This is cliche, but those who fail to plan, plan to fail. Thu, Jan 19, 2012 : 2:44 p.m.
&quot;Several&quot; is the understatement of the century. Officers are calling for the road commission to salt, per usual, all over the place. Seven Mile has been shut down. One man had an arm injury, another a leg injury. The accident count may surpass the one the other day. Thu, Jan 19, 2012 : 4:40 p.m. There's no way to plow ahead of time and salt doesn't do much good on snow. Drivers can see the road conditions. Slow down.